New Jersey has maintained strong position relative to other states both in terms of NAEP achievement gains, especially for lower income students and in terms of school funding fairness in our annual report. 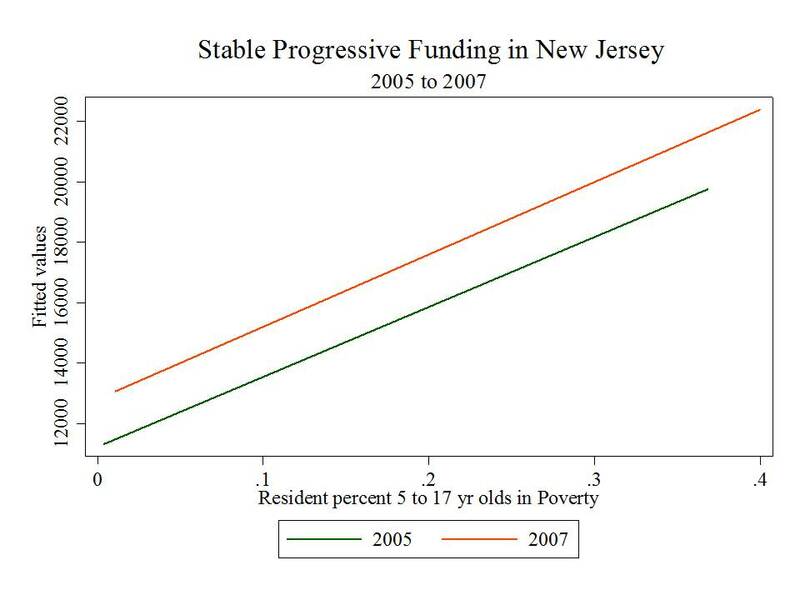 I have often used New Jersey as a model of a sound, progressive state school funding system and one that has produced some reasonable initial results. In fact, I was about to start writing a post on that very point. Way too many of my posts on school funding equity/inequity have been negative. Heck, I just posted the “most screwed” districts in the nation. I was looking for an upside. A model. Some positives. A state that has maintained a solid progressive funding system even through bad times. 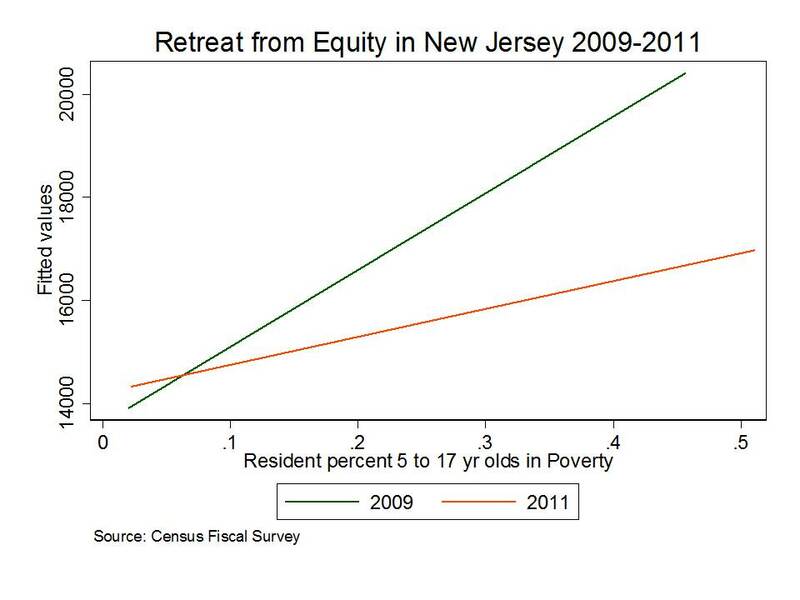 So, I went back to the New Jersey data, and included the recently released 2010-11 Census Bureau data. What I found was really sad. The following figures reveal the damage to funding progressiveness accomplished in New Jersey over a relatively short period of time. A system that was among the nation’s most progressive in terms of school funding as recently as 2009 appears – based on the most recent census bureau data on current expenditures per pupil – to have slipped not only slightly… but dramatically. 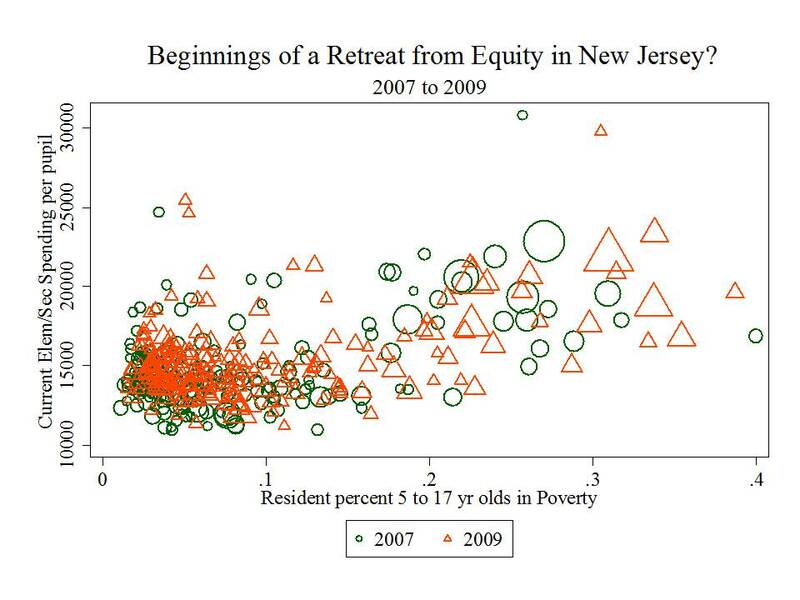 Here are the year to year snapshots, first as graphs of the actual district positions (for districts enrolling 2,000 or more pupils, with circle/triangle size indicating enrollment size) and then as the lines of best fit for each distribution, which indicates the “progressiveness” of the funding system with respect to poverty. The damage done is rather striking and far beyond what I ever would have expected to see in these data. It may be that there are problems in the data themselves, but separate analyses of the revenue and expenditure data and use of alternative enrollment figures thus far have produced consistent results. 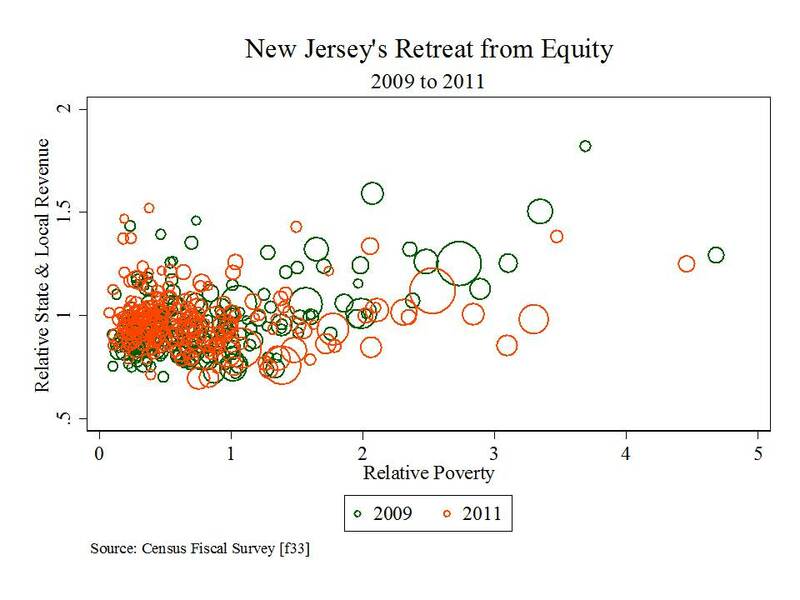 In fact, analyses using state and local revenue data look even worse for New Jersey. And these charts do not adjust for various cost factors. 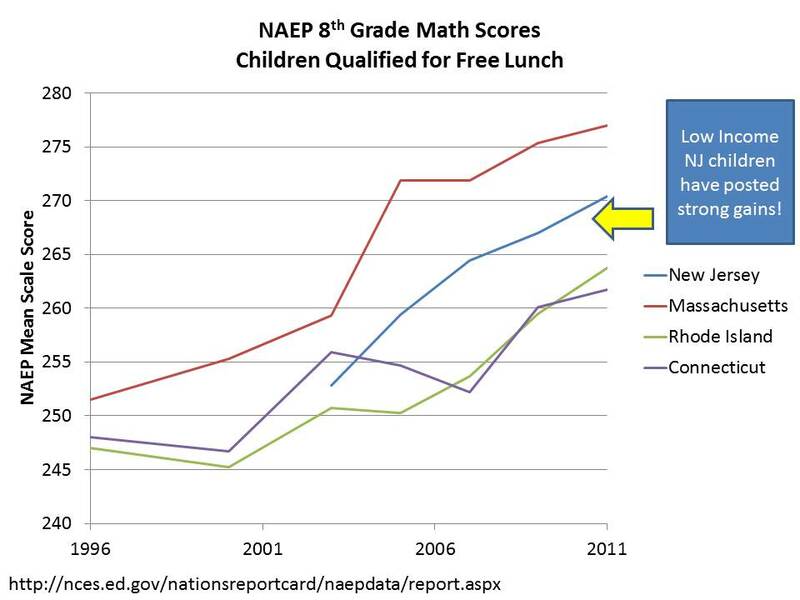 They are what they are (variable ppcstot, or per pupil current spending, with respect to census poverty rates). 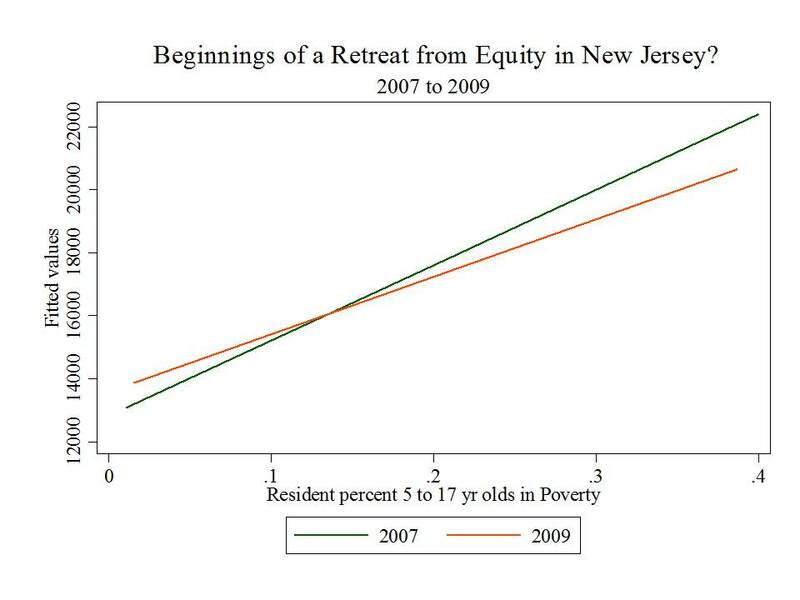 Meanwhile, efforts continue to cause even more damage to funding equity in New Jersey, amazingly using the argument that reducing the funding targeted to higher need districts and shifting it to others will somehow help New Jersey reduce its (misrepresented) achievement gap between high and low income children. We may or may not begin to see the fallout – the real damages – of these shifts this year, or even next. But there will undoubtedly be consequences. Current policy changes, such as the use of bogus metrics to rate and remove mythically bad teachers will not make it less costly for high poverty districts to recruit and retain quality staff. In fact, it may make it more expensive, given the increased disincentive for teachers to seek employment in higher poverty settings, all else equal. Nor will newly adopted half-baked school performance rating schemes. Nor will the state’s NCLB waiver which hoists new uncertainties and instabilities onto districts serving the neediest students with annually less competitive revenues and expenditures. As I’ve said numerous times on this blog – equitable and adequate funding are prerequisite conditions for all else. Money matters. 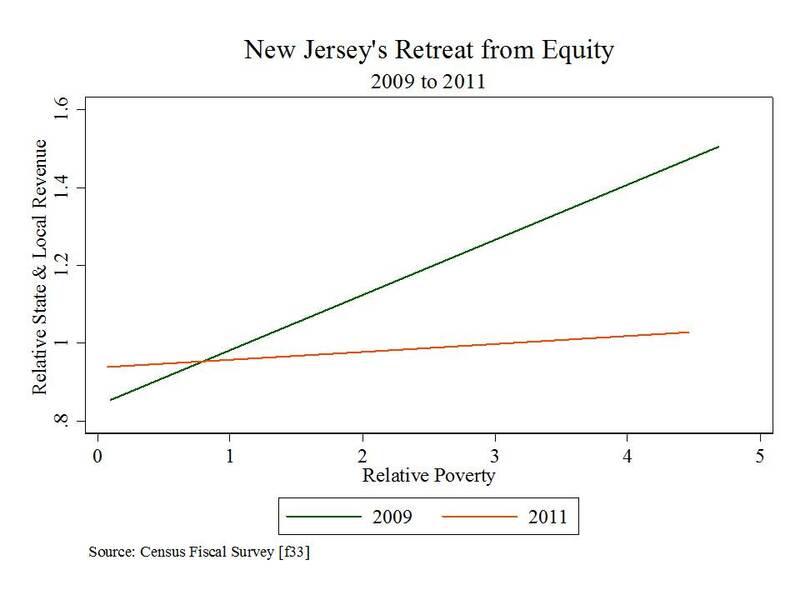 And the apparent dramatic retreat from equity in New Jersey over a relatively short period of time raises serious concerns. 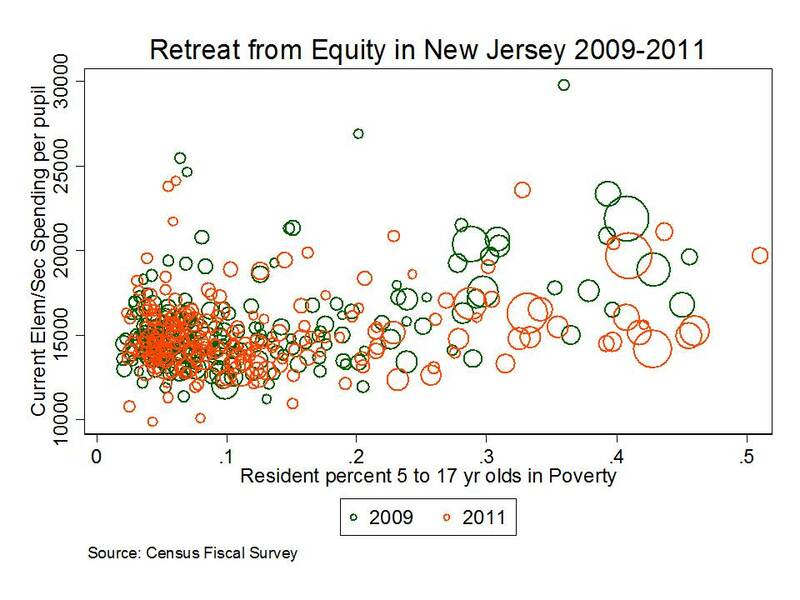 Below is the retreat from equity in state and local revenues per pupil with respect to poverty. In this case, I’ve expressed state and local revenues relative to the average state and local revenues of districts sharing the same labor market and I’ve expressed poverty similarly. 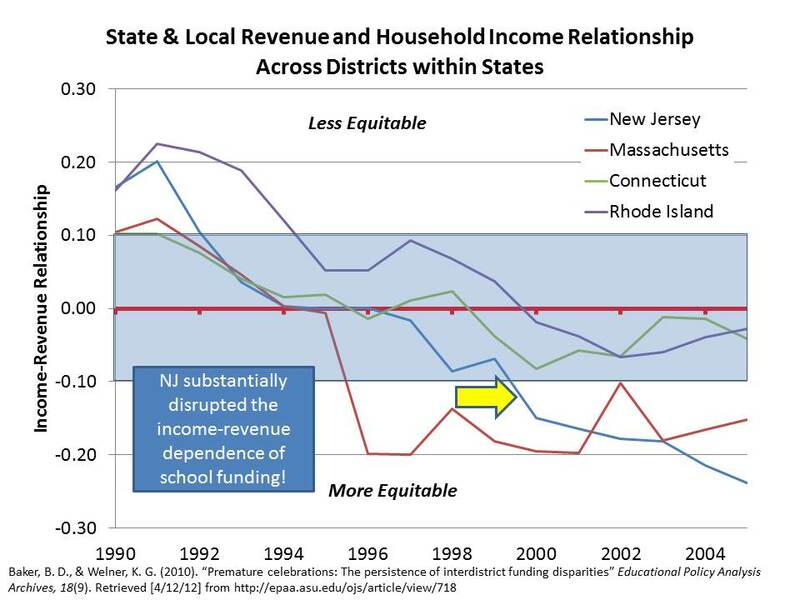 Previous Follow-up: Title I Funding DOES NOT Make Rich States Richer! This is really powerful stuff! Is there any way to do a version that is a little easier for non-technical folks to follow? 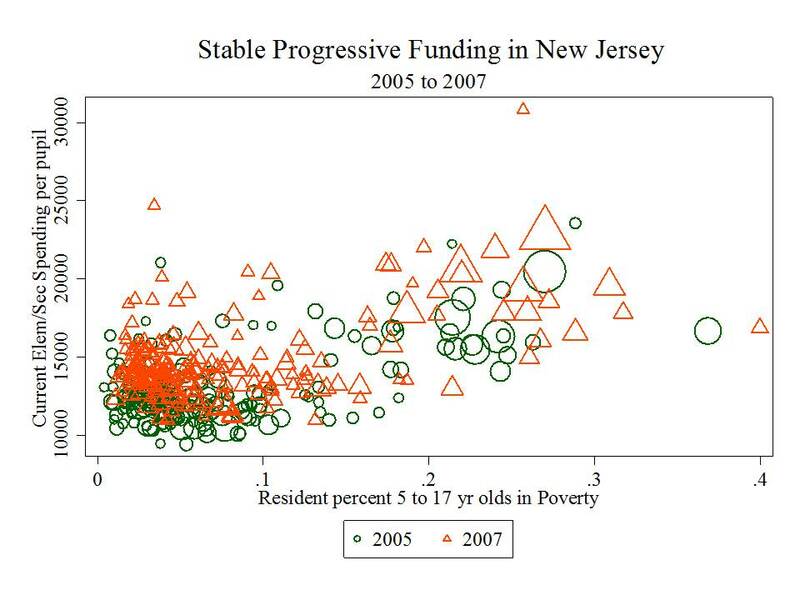 Specifically, graphs showing the relationship between income and school funding breaking post 2009. I also was wondering if you can say why that is occurring? Is it due to the 2010 cuts or the adoption of SFRA? Working on longer, more thorough brief for the other site! Combination of factors behind the shift. Much more dramatic than I ever expected. Good work , Bruce. The consequences are already apparent: larger class sizes, for example….which ironically can lead to school closings: teacher 1, teacher 2 and teacher 3 have identical class sizes. Maybe 21 per class. But due to budget cuts, the principal decides ( or is instructed) to remove teacher 2, and so the class she taught is distributed to teachers 1 and 3, who now have classes of 30 and 31 respectively. There is now an “unused” classroom, which contributes to the assessment that the school is underutilized and therefore subject to closure…. which usually means relegation to a charter school. Indeed, I’ve been doing some writing on this blog about the policy induced demand for charter schooling. Policymakers like to point to charter school waiting lists and growth rates as evidence of market driven charter success and the need for more charters. But, these same policymakers are arguably manipulating those markets quite substantially. In extreme cases like Philadelphia and Chicago, they are manipulating the markets by simply closing down all district schools accessible to some neighborhoods… creating less than palatable alternatives for parents wishing keep their kids in district schools and thus stimulating a false sense of charter demand. In other less extreme though comparably disturbing cases, like NYC, they are coupling less dramatic closures with simply making the public school classroom setting undesirable, by increasing average class sizes above 30 in many cases, and for that matter, by imposing policies such as the new teacher evaluation policy. 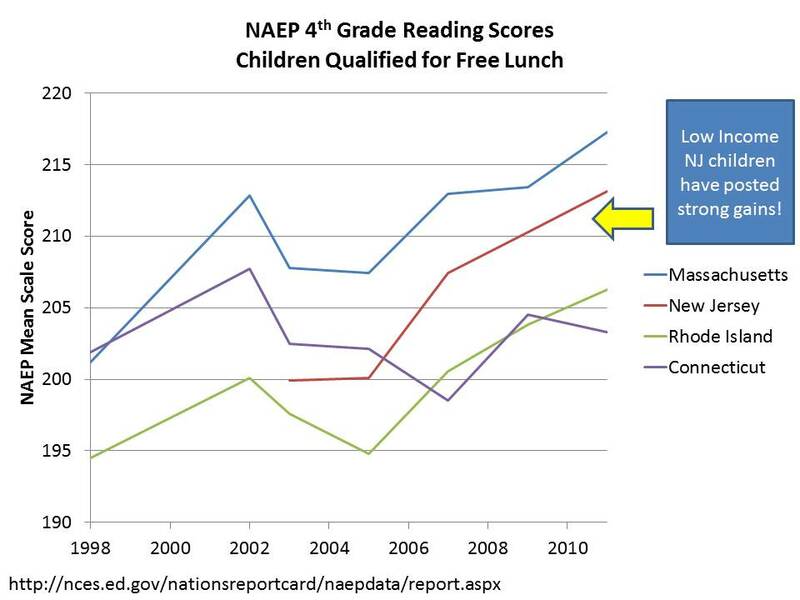 This too makes the charters seem more appealing… and creates policy pressure to increase their access to space, etc. Starving district schools financially, and shifting more resources to charters perpetuates this myth of market driven success of Charter schools. Hard to know when/if this will turn around. I take your word for it although I am hopeless about understanding those graphs. IMO, the elephant in the room, which the media will not talk about is that teachers who have a choice will not teach in high poverty area schools because – like everyone else – teachers fear for their safety. I don’t know how you can compensate a good teacher enough for teaching in those schools. I do worry about how they spend the money on other things, though. I plan to work on a more reader friendly post. Thanks.